Residential and commercial buildings together currently account for 40% of the total consumed energy. With a wide access to cheap energy, a culture of wastage has emerged and is one of the major causes for greenhouse gas emissions. According to a study by the Environmental Protection Agency, household energy wastage accounts for over 30% of the nation’s CO2 emissions. With better technology and a rise in awareness, this number is slowly on the decline and Georgia Tech is playing its part in helping reduce energy wastage in all areas of life. The Greenovation competition held in Fall 2016 by the Georgia Tech SGA Sustainability Committee aimed at funding innovative ideas by student organizations to promote sustainability on campus. One of the winners for the competition was the project “Turn Down for Watt”. This project was a combined initiative started by the Georgia Tech Energy Club and Energy Jackets – a grand challenges program. The project plans to raise awareness on campus residence halls about the preservation of energy and to encourage students to save as much electricity as possible by quantifying the amount of electricity consumed in residence halls. The Office of Campus Sustainability was able to talk to Natalie Chu, a member of the Energy Club who had the inspiration behind this idea. 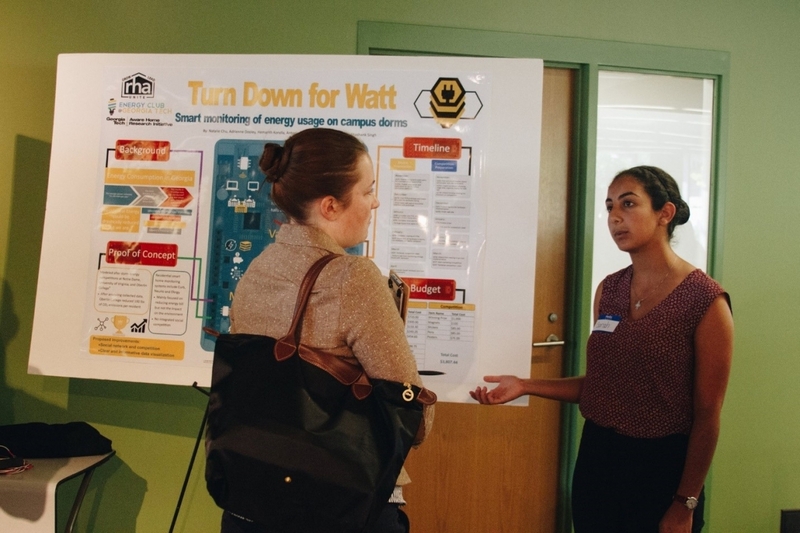 Natalie came up with this idea while interning this past summer and meeting a fellow intern from Notre Dame College, who told her about a week-long competition held at their campus to determine which residence hall would save the most energy. Inspired by the effort to promote awareness about energy wastage in households, Natalie tried to introduce this at Georgia Tech. She wanted to use Tech’s own resources in terms of students and staff to help make it possible rather than hiring an expensive outside firm to do the audits. Therefore, she contacted Facilities to talk about the idea over the summer and they agreed to help with the project. RHA and Housing Staff quickly came on board as well and she soon found out that Energy Jackets had already built a hardware to test for the amount of electrical usage using an open-source electronic prototyping platform called Arduino. After combining all these resources and forming a concrete plan and definitive timeline, the group entered the Greenovation competition to get funding for developing the software which is currently under work. The idea behind this is to have a week long competition starting from next fall with the initial halls being on West Campus and to have each floor compete against each other (in the same residence hall as well as with different residence halls). A PCB (printed circuit board) will be installed around the circuit breakers in the dorms as a non-invasive meter to measure the amount of electricity consumed. The winners will be chosen based on the percentage reduction of electricity consumed in each floor. The proposed plan for the project however, is to have a week long competition every semester to keep students aware of their responsibility to conserve energy and to hopefully include all forms of energy and water monitoring systems in the future. Currently the group is looking for people to help with the project, specifically to help make PCB circuit boards and to help with marketing of the event for Fall 2017. For any specific questions, or to get involved in the project please send Natalie an email at natchu8@gatech.edu.